With the Plum Drop game over, Chapters-Indigo has come out with yet another promotion. Now through September 16th, you will earn 4500 Plum Reward points on any purchase of $50 or more in-store. The $10 reward will really help with back to school book costs for students. 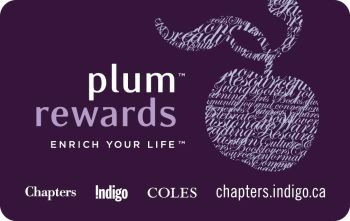 If you don’t have a Plum Rewards card, you can sign up online and print a temporary card here.